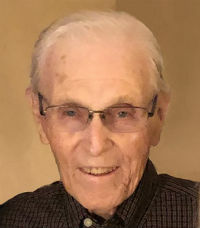 Lewellyn Curtis Johnson, age 92 of Tracy, passed away November 7, 2018 with his son and daughter by his side under the care of Prairie Home Hospice of Marshall. Funeral Services will be held at 10:30 a.m. Thursday, November 15 at Tracy Lutheran Church. Visitation will be held 4:00 p.m.-7:00 p.m. Wednesday at the Tracy Area Funeral Home with a prayer service at 6:30 p.m. Visitation will continue one hour prior to the service at the church on Thursday. Interment will be in the Hoiland Lutheran Cemetery. In lieu of flowers, please send memorials to the Tracy Lutheran Church Building Fund, 64 Rowland St., Tracy, Hoiland Lutheran Cemetery Association, C/O Dale Howe, 901 4th St. South, Marshall, or Prairie Home Hospice House, 408 E. Main St. Suite 8, Marshall. Stephens Funeral Service – Tracy Area Funeral Home is assisting the family with arrangements. Lewellyn Curtis Johnson was born August 24, 1926 to Alfred and Della (Froland) Johnson in Normania Township of Yellow Medicine Co., MN. He was baptized and confirmed at St. Lucas Church, rural Cottonwood. He graduated Clarkfield High School in 1944. He entered the Army in January of 1945. He served in World War II and was honorably discharged in November of 1946. He was united in marriage with Doris Lorraine Helleson on November 28, 1948 at Tracy Lutheran Church and was blessed with two children, Steven and Marjean. Together, Lewellyn and Doris traveled around the United States and made a yearly trip to Branson, Missouri for 17 years. He had a passion for farming and was proud that his farm was recognized as a century farm in the state of Minnesota. His motto was faith, family, and farming. He was proud and grateful that his son and now his grandson have taken over the farming. Over the years he continued to help on the farm whenever and wherever he could. It can be truthfully said that his farming days did not end until he closed his eyes for the last time. He enjoyed family celebrations where he looked forward to spending time with his children, grandchildren, and great grandchildren. Lewellyn was an active member of Tracy Lutheran Church and was the Hoiland Lutheran Cemetery Treasurer for 45 years. Lewellyn is survived by his son Steven (Pamela) Johnson of Tracy; daughter Marjean (Loren) Sanderson of Crookston; grandchildren Jared (Summer) Johnson of Tracy, Travis (Bridget) Sanderson of Thornton, CO, Joshua (Fiancée Candice Maier) Sanderson of River Falls, WI, and Jenny Johnson of Bentonville, AR; great grandchildren Shelby, Brice, Hadley, Ryann Johnson of Tracy and Macklin Sanderson of Thornton, CO; and sisters-in-law Gloria Johnson of Clarkfield and Grace Helleson of Tigard, OR. He is preceded in death by his wife of 62 years Doris; parents Alfred and Della Johnson; brothers Delmore and Vernon; and brothers-in-law Manley and George Helleson. I remember meeting Lewellyn years ago at a Farm show in Tracy, during our visit I learned that he was a cousin of my good friend Phil Johnson, a home builder in Windom, My hometown. I told Phil I met Lewellyn, he had great memories and things to say about his cousin. You have my sympathy on your loss. Pete this is Lewellyn Johnson’s daughter Marjean. I’m wondering were you live now? Dad and Phil were considered double cousins. Their Dad’s were brothers and their mother’s were sister’s. Our Mom always thought Dad and Phil looked alike. Marjean, I have lived in Apache Junction, AZ for the last 27 years during the winter season, and the Black hills for about 25 in the summer. I saw the strong resemblance Between Phil and your dad, they looked like brothers. Your dad & Phil told me that they were double cousins. I also knew Phil’smother. Phil was a very good friend for many years. I was in Real Estate and sold many home he built. He help many young people buy their first home. My website is petebyam.com. Marjean, I know that you loved your dad so very much and he will always be with you. I offer my sympathies to you and Loren.